Well, I’m still trying to figure out exactly what I’m doing with this blog. What is my purpose? Am I trying to actually teach people how to cook? Or am I just telling you all what I had for dinner last night, mainly in order to give you new ideas? Are you all just wondering what you CAN eat on the Atkins diet? Should I be posting once a day? A couple of times a week? Should I post full recipes and instructions, or just a basic summary? I’m still working these issues out, so please give me your feedback. I got a lot of views on my first post, and only two (!) on my second, so I guess I just want to make sure that if I’m just posting for Liz and Shannon, I at least know my audience! I didn’t post anything about last night, because Andrew was working late and not eating with us, and I tend to go really simple when he’s not around. So, we had skillet-cooked brats and steamed cauliflower. I have to admit, though, a plain brat with nothing on it is just a little unsatisfying. 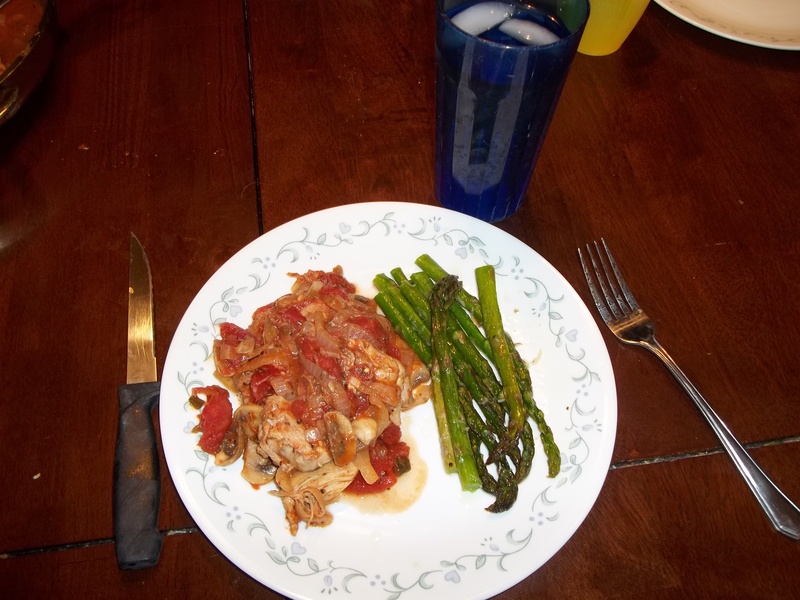 Tonight I made chicken cacciatore from a recipe I found on the Atkins site. I have made chicken cacciatore many times before, but I thought I’d try the Atkins way just to see how it was. 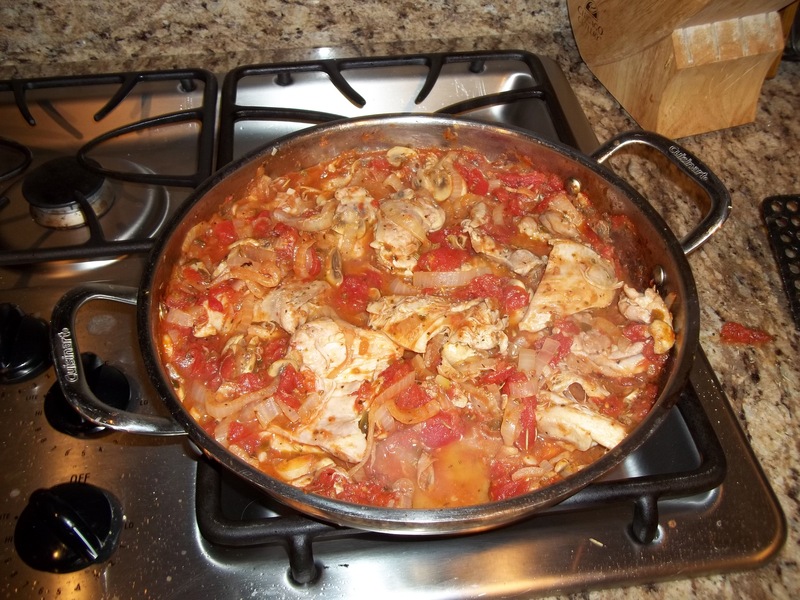 If you are not familiar with the dish, it’s basically an italian chicken stew with tomatoes, onions, mushrooms, and garlic. You brown the chicken in a skillet, then remove it while you saute all the veggies except the tomatoes. Deglaze it with a little white wine or chicken broth (that means put a little bit of liquid in the pan to soften the leftover brown pieces of meat that are stuck to the bottom of the pan and to infuse the sauce with their flavor), and add a couple cans of tomatoes. Bring it to a boil, then reduce the heat and let simmer for ten to fifteen minutes until all the veggies are cooked down and the mixture is kind of soupy. Return the meat to the pan, cover, and let simmer until the meat is cooked through (ten minutes for boneless pieces, twenty or so for bone-in pieces). Serve by itself if on Atkins, or over rice or pasta if not. While not awful, this didn’t turn out as good as I had hoped. The main problem, I think was that the Atkins recipe said to add rosemary with the veggies, and I think that it just didn’t go with the dish. Also, I realized too late that instead of regular diced plum tomatoes, I only had “italian style” stewed tomatoes, that had their own set of spices in them already that didn’t really go with the rosemary. After eating the meal, I also felt like it was way too sweet. I looked at the ingredients on the can, and lo and behold, they had added to sugar to it! You never know where you’re going to find sugar, people! They’re so sneaky! I know that they add sugar to spaghetti sauce a lot, which I don’t understand. I don’t like sweet spaghetti sauce. Isn’t there enough flavor without it? Anyway, it was edible, but not great. Andrew really doesn’t like the taste of rosemary, and while I like it in some things, it just did not work here. 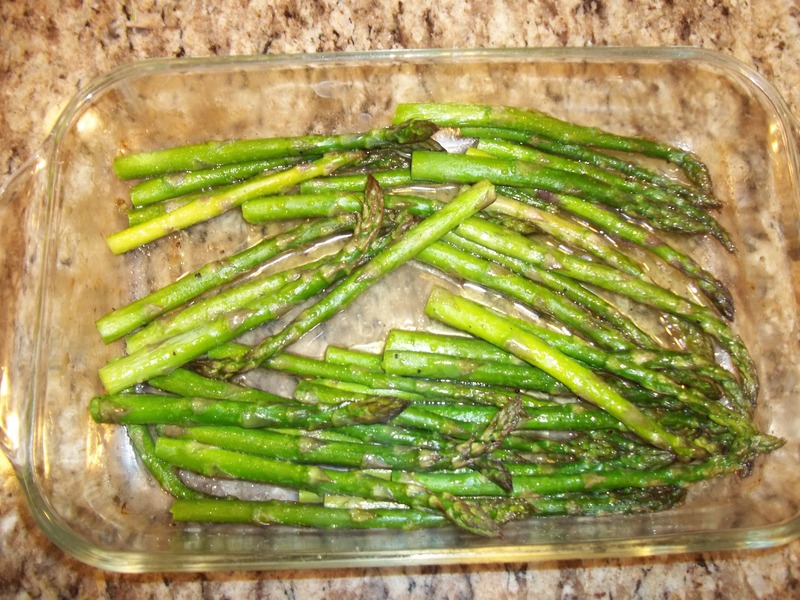 I also made some roasted asparagus. I just trimmed the tough ends off the asparagus so that they were about 5 or 6 inches long. Then I put them in a shallow baking dish, drizzle with olive oil, sprinkle with salt and garlic powder, and cook them at 450* (does anybody know how to type a degrees symbol on here?) for about fifteen to twenty minutes until tender. Sometimes this turns out really well, and sometime it’s not quite right. I think I should have added some lemon zest or something this time. The Food Network suggests adding chopped pine nuts and chopped parsley. Mmmm, that would have been tasty! I love me some pine nuts! Hey, I made your pork chops tonight and they were a hit. Chris asked me why I had never made them before and I told him it was because I didn’t know how. So thanks!! 1. Just stating what you ate and how it was received by your family. This gives me ideas on how to expand our menu. 2. The recipe or where to find it. I just wanted to tell you I look at most blogs in my feed-reader, so it might not show on your stats every day. But I am reading, and I would agree with Shannon’s advice above. It’s just fun to know what someone else is cooking!